YOKOSUKA NAVAL BASE, Japan -- The nation's only forward-deployed aircraft carrier recently returned to its Yokosuka homeport after spending nearly four months patrolling the Western Pacific. Families and friends of the USS Ronald Reagan sailors waited with patriotic signs as their loved ones pulled into port. They were joined by Santa Claus, who welcomed the crew home just in time for the holidays. The carrier and its crew of more than 4,000 service members set sail Aug. 14, kicking off its second cruise of the year by training with the Japan Maritime Self-Defense Force in the Philippine Sea. The Ronald Reagan had completed a two-month patrol of the South, East and Philippine seas in July. Working with the Navy's Japanese counterparts was a key element of the Reagan's underway period, 7th Fleet spokesman Lt. Joe Keiley said. 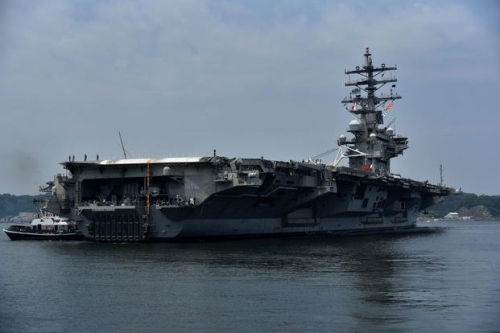 "While underway, Ronald Reagan participated in several cooperative deployments with the JMSDF and conducted multiple exercises including Valiant Shield 2018 and Keen Sword 2019," he said. Keen Sword brought the United States and Japan together last month for training on land, sea and air across the region. The Ronald Reagan participated in anti-submarine drills with F-18 Super Hornets during the exercise. Valiant Shield took the crew to the Northern Marianas in September for a weeklong, U.S.-only exercise with 15,000 sailors, airmen, soldiers and Marines. The group practiced maritime-security operations, anti-submarine and air-defense drills and sunk a decommissioned ship with live fire in a sinking exercise. In early November, the Ronald Reagan took part in dual-carrier drills with the USS John C. Stennis off the coast of the Philippines near the disputed Spratly Islands in the South China Sea. The Ronald Reagan also made numerous port visits during the patrol. "Personnel from the Ronald Reagan Strike Group also visited several ports including Apra Harbor, Guam; Jeju, Republic of Korea; and Hong Kong, People's Republic of China," Keiley said. The port visit to Hong Kong was especially significant because it marked the first time U.S. vessels visited China since the country denied the USS Wasp a similar visit in September. The Sasebo-based amphibious assault ship's denial had come after 10 percent tariffs were levied on $200 billion of annual Chinese imports and the U.S. had issued sanctions on China after discovering the country had bought fighter jets from Russia and a surface-to-air missile system. One Ronald Reagan sailor, Petty Officer 3rd Class Zahir Hakeem, died during the port visit to Guam. He went missing while swimming near Haputo Beach at Naval Computer and Telecommunications Station Guam, the Navy said. His body was discovered in the water the following day.